Rescue workers on Monday were searching through the debris of Building 112 at the Baikonur Cosmodrome where portions of a roof collapsed and fell 220- feet to 260 feet to the bottom of the hangar. An eight-man construction team was on the roof when the accident occurred on Sunday. Sergei Gorbunov, a spokesman for the Russian space agency, told RTR state television it was unlikely any of the men survived. By early Monday, six bodies had already been recovered from the wreckage, according to ITAR-TASS news reports. The cause of the roof collapse is under investigation, but officials have ruled out a terrorist attack. In an interview with Tass, Gorbunov said one theory is that a heavy object fell from the roof and crushed one of three Energia fuel tanks housed in the hangar, creating a huge rush of air that triggered the roof's collapse. 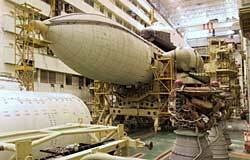 Also damaged or destroyed in the accident was one of the three mothballed Buran space shuttles. The former Soviet Union abandoned the Buran program after a single successful flight in 1988. The damaged hanger originally was built in the late 1960s for the ill-fated Soviet moon program and was later modified to handle the Energia booster and the Buran shuttle. Part of the hangar also was used by the European-Russian commercial launch services venture, Starsem. 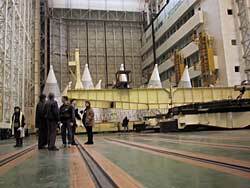 The company's satellite preparation clean rooms for its commercial Soyuz operation, as well as a workstation for the new Soyuz-2 booster, were located in Building 112. Starsem officials could not be reached for comment. An Interfax news agency report said the chamber and workstation were not damaged but obviously could no longer be used in Building 112. 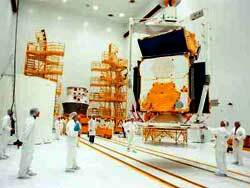 The affect on Starsem's launch schedule was not immediately known.